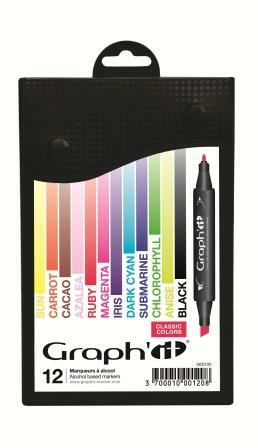 Graph'It Markers sets have a modern fresh design with a premium look and feel. The 12 sets are pakaged in a stylish black PP case that has a sliding drawer to give easy access to the product. The packaging is designed as a carry case for the markers giving them a permanent home and making them easy to take to a workshop or college class. The boxes have a euro hook facility so they can be merchandised on hanging pags or displayed as stand alone items. The front of the pack clearly illustrates the colours included in each set and has a barcode prominently displayed. Home & Fashion, Classic Colours, Manga Colours, Wood/Earth colours, Warm Grey Colours, Neutral Grey Colours, Skin Colours, Soft Pastel Colours and Mixed Grey Colours. The 24 Graph'It Marker Sets come in an attractive high quality black zip around wallet. There are 2 variants in the 24 Set: Basic Colours and Managa Colours. The 24 sets are priced so that the consumer only pays for the markers and receives the 24 Wallet free as an added value item. A new range of Blending sets of 3 Markers have been developed. They are designed to help consumers who may struggle to select 3 colours that will work and blend beautifully together. There are 12 different blending sets to choose from. Graph ItEverest Blending Set of 3 markers is designed to help you select thre colours that will work perfectly together. Set contains Sky, Celestial and Lapis. Graph It Nature Blending Set of 3 markers is designed to help you select thre colours that will work perfectly together. Set contains Pistachio, Lime and Tuscany.